Super Deluxe on the Lake - love the cigar room! The Zuri Kumarakom, Kerala Resort & spa, is built on 18 acres, this five-star deluxe resort with one of the finest spas in the country is located in 'Kumarakom', right on the shore of the 205 square kilometer Vembanad Lake. Kumarakom Lake Resort is a luxurious property on the shores of the Vembanad Lake at Kumarakom. 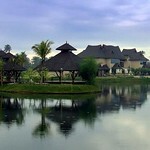 The resort is considered one of the best in India and has received a number of global awards for service. 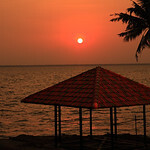 Kayal Resort is a lake front resort located on the shores of the Vembanad Lake. The Edassery Group of Hotels has been experimenting in hospitality for over a decade now and the Kayal Resort kumarakom is its latest venture. Kumarakom, where this hotel is thoughtfully sited, always occupies the top position on any holiday maker’s favorite list, and, the Kayal resort brings within its bulwark the tinges of this beautiful cluster of islands exemplified by personal service and supreme facilities. Backwater Ripples is a land mark in the expansive Vembanadu Backwater Lake Shore in Kumarakom, Kerala. The resort has independent luxury cottages and villas in a range of layouts including cottages with a spectacular view of the Vembanad lake. A boutique resort which Offers unmatched 360-degree views from almost every vantage point amongst its tropically landscaped, sprawling grounds, all guest rooms with spacious outdoor balconies and sweeping vistas. A boutique resort with lake views in a stunning location! 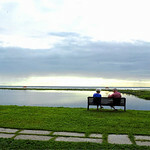 A beautiful and romantic honeymoon location at Kumarakom. 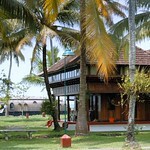 The Kumarakom Lagoon is a lovely place in Vembanadu island for a relaxed getaway. It is a small property which can be accessed only by boat. Peaceful atmosphere, beautiful view and cushy ambiance is what you get here. 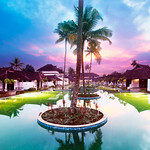 Taj Garden Retreat, now known as Vivanta Kumarakom is a luxury hotel in Kumarakom, with modern living facilities but still retains the traditional old style. 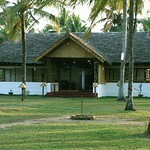 It is next to the famous Kumarakom Bird Sanctuary and offers warm service and clean environment. A 5-acre water front property has 28 appealing cottages, with 4 star amenities, that offer splendid overview of the unspoilt backwaters. 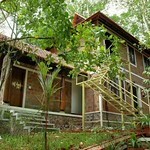 Small resort in Kumarakom with charming tree house and general location. Budget rates and popular as a result. This is a selection of accommodation, including Kumarakom hotels, resorts and assorted homestays in Kumarakom, Kottayam.You can book all these properties through us, simply call or email us and you can also ask us advice concerning which will suit your special needs. 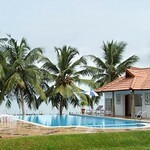 We have selected a limited number of accommodation establishments and hotels in Kumarakom. 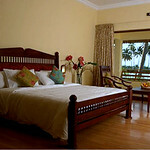 We have more details of the local Kumarakom places to stay.